Purchase 7839 x 5229 pixel digital file by using the Buy Now buttons below. You will receive an email with the download link. You can use the link 5 times to download the digital file. Ancient aura series is an elephant based fusion of intricately decorated Gaja with a glimpse of the popular Indian historical places. 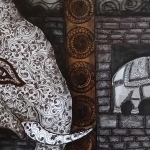 It is inspired from the fine carvings and architecture of Indian Temples, forts , sculptures and monuments .This composition is based on the Elephant Statues guarding the Nathmal Ji Ki Haveli in Jaisalmer, Rajasthan. 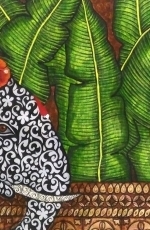 It is a representation of Gaja as a part of Indian Culture, Tradition and Civilization..
New artwork uploaded. Ancient aura series is an elephant based fusion of intricately decorated Gaja with a glimpse of the popular Indian historical places. It is inspired from the fine carvings and architecture of Indian Temples, forts , sculptures and monuments .This composition is based on the Elephant Statues guarding the Nathmal Ji Ki Haveli in Jaisalmer, Rajasthan. It is a representation of Gaja as a part of Indian Culture, Tradition and Civilization.